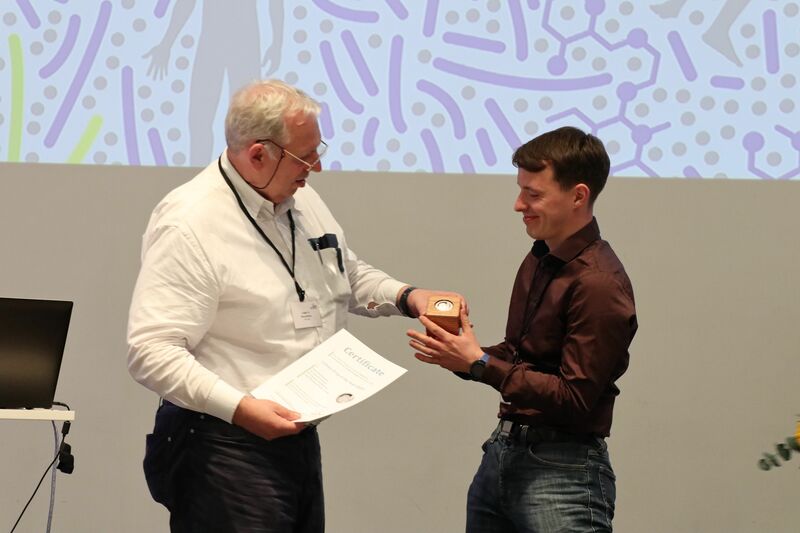 The newly discovered substance Gramibactin was awarded the title “Leibniz Drug of the Year 2019”. 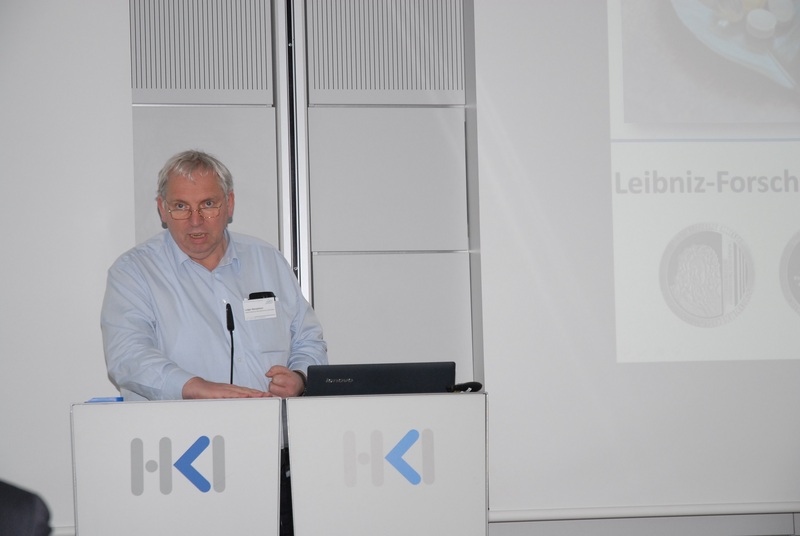 The research team of Professor Christian Hertweck at the Leibniz Institute for Natural Product Research and Infection Biology (HKI) was honored on 1. April at the Leibniz-Wirkstofftage at the German Hygiene Museum in Dresden. The bacterial molecule Gramibactin is very important for food production: it allows plants to absorb more iron from the soil. The increased intake of iron promotes the growth of plants and thus leads to higher yields. Original publication: Hermenau R, Ishida K, Gama S, Hoffmann B, Pfeifer-Leeg M, Plass W, Mohr JF, Wichard T, Saluz HP, Hertweck C (2018) Gramibactin is a bacterial siderophore with a diazeniumdiolate ligand system. Nature Chemical Biology 14, 841-843. 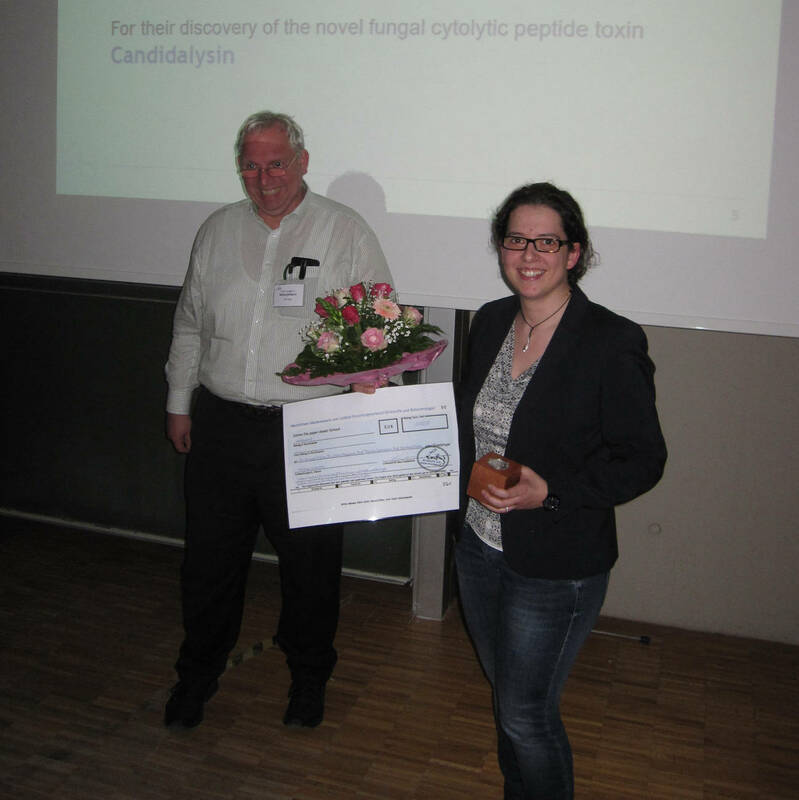 The prize Leibniz Drug of the Year 2018 was awarded for the discovery of Balansins A and B. 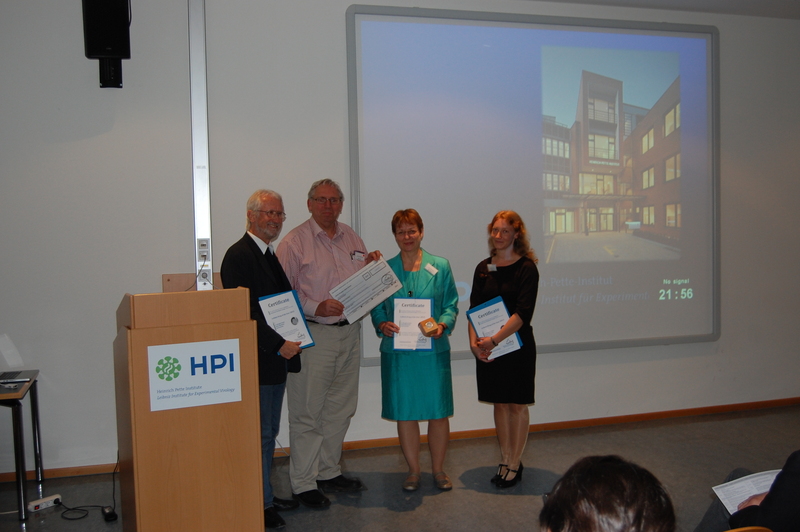 Award winners are Prof. Ludger Wessjohann (discoverer), Dr. Silke Pienkny, Dr. Andrea Porzel from the IPB, and Prof. Wolfgang Meyerhof, Dr. Juliane Bojahr and Dr. Anne Brockhoff from the DIfE (German Institute for Human Nutrition Potsdam-Rehbrücke) as Leibniz researchers. Aditionally scientists from Vietnam, Prof. Tran Van Sung, Dr. The Anh Nguyen, Dr. Ngo Van Trai, and from Symrise AG, Dr. Jakob Ley, Dr. Katharina V. Reichelt, Katja Obst, were involved in the discovery process. Balansins A and B are new sweeteners derived from the Vietnamese plant Mycetia balansae. They have a structure and taste profile that differs from stevia or licorice terpene glycosides. The invention relates to the use of these sweeteners, preferably an extract of Mycetia balansae, to produce a sweet impression or enhance sweet taste. After original discovery, the compounds were characterized for their chemical and receptor profile in a cooperation of IPB and DIfE, two members of the Leibniz research alliance on bioactive compounds and biotechnology. In 2017 the commitee awarded four scientists from two Leibniz Insitutes the prize Leibniz Drug of the Year: Dr. Duncan Wilson (HKI), Dr. Selene Mogavero (HKI), Prof. Thomas Gutsmann (FZB) and Prof. Bernhard Hube (HKI) from Leibniz Institute for Natural Product Research and Infection Biology – Hans Knoell Institute Jena (HKI) and Research Center Borstel Leibniz-Center for Medicine and Biosciences (FZB). Their group was involved in the discovery of the novel fungal cytolytic peptide toxin Candidalysin. According to the committee, this work is of high importance for future clinical development of antimycotics. 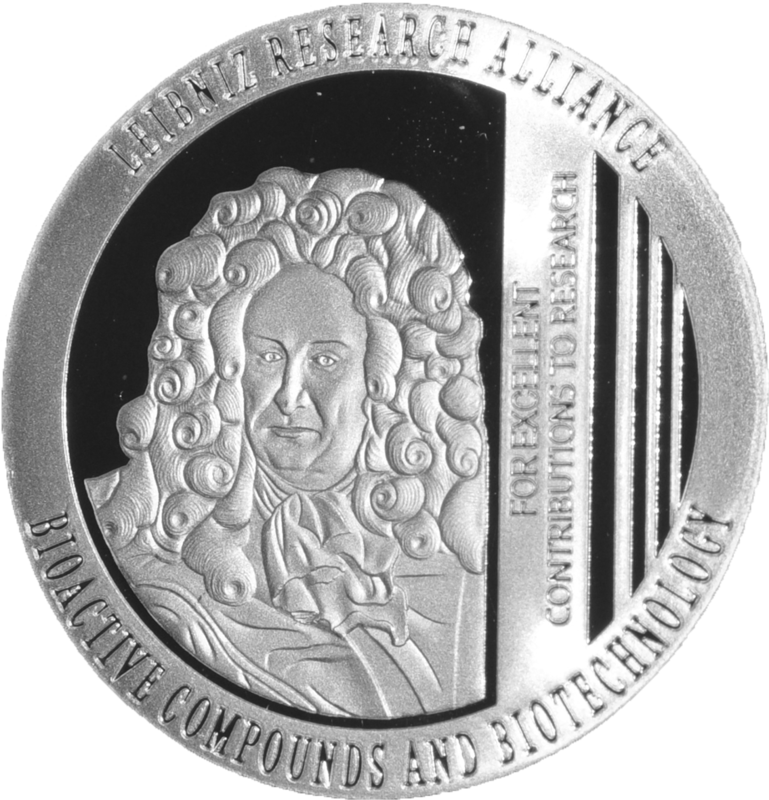 Since 2014, the “Leibniz Drug of the Year” Award is conferred annually for those, within the Leibniz Association, who developed the most prominent bioactive compound. The commission of the Award found this year two contributions as extremely important for the drug development. Therefore, for the Leibniz Drug of the Year 2016 awarded are teams from Hans Knöll Institute Jena (HKI) and Leibniz Institute of Plant Biochemistry (IPB). 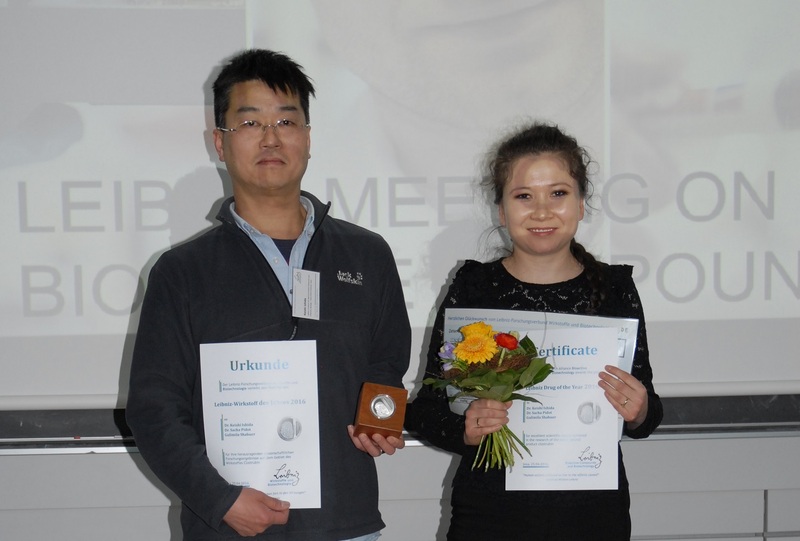 Dr. K. Ishida, Dr. S. Pidot and G. Shabuer (HKI) received award for excellent scientific results achieved for the research of the novel natural product clostrubin. They demonstrated that the clostrubin biosynthetic pathway is essential for the anaerobe to enter an oxygen-rich world (for more information see: Science 2015, 350, 670; Angew. Chem. Int. Ed. 2014, 53, 7856). The discovery of clostrubins will have a major impact on various areas of research, including molecular microbiology, natural product research, crop protection, and infection biology. Prof. Dr. L. A. Wessjohann, Dr. A. Porzel, Dr. O. Pando, S. Stark, R. Kufka and A. Denkert (IPB) were awarded for excellent scientific results achieved in the research area of the bioactive agents tubugis. This group reported on the first synthesis of natural product tubulysin analogues “tubugis” by means of a combination of three different types of isonitrile based multicomponent reactions in a concise and convergent manner (for more information see: J. Am. Chem. Soc. 2011, 133, 7692). The new cytotoxic tubugis show GI50 values in the low picomolar range. The present findings will encourage further investigations on the application or development of new (combinations of) MCRs as a powerful means for the synthesis of complex natural products and related compounds. A group from the Leibniz Institut für Molekulare Pharmakologie im Forschungsverbund Berlin e.V. (FMP): Margitta Dathe, Heike Nikolenko and Katrin Jordan was awarded with the Leibniz Drug of the Year 2015 for the work on the recombinant human transglutaminase 1 (rhTH1) encapsulated into liposomes. Development of rhTH1 addresses a disease for which there is an acute need for treatment. This disease, autosomal recessive congenital ichthyosis (ARCI), is a genetic disorder that manifests itself in severe, highly visible skin dysfunction starting at newborn age and affecting patients for their entire lifes. rhTH1 is designed as replacement therapy to substitute the enzyme that is not expressed in ARCI patients. Currently, no drug is available for causative treatment of ARCI, and rhTH1 could therefore be the first of its kind. rhTH1 was developed in a highly successful collaboration and proceeded to an advanced stage for which the data suggest significant potential to enter the clinic. The winners elegantly addressed the formulation issue by developing a liposomal carrier system that contains a cationic lipopeptide. In contrast to the free enzyme, this system is able to overcome the cellular barrier and reach the interior of enzyme-deficient keratinocytes. Encapsulated rhTH1 was shown to normalize the ARCI phenotype in a skin-humanized mouse model, thus demonstrating conceptual feasibility of the treatment. The advanced status of this drug candidate is also evident from the fact that it received orphan drug status. 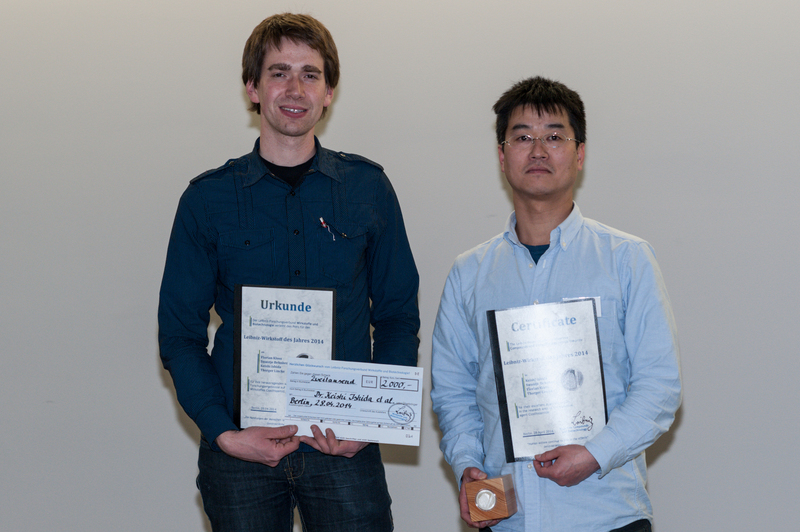 The prize Leibniz Drug of the Year 2014 was awarded to the team from the Leibniz Institute for Natural Product Research and Infection Biology Hans Knöll Institute (HKI) in Jena: Swantje Behnken, Thorger Lincke, Florian Kloss and Keishi Ishida from the group of Christian Hertweck. They developed a new substance class of Closthioamide which was biosyntheticaly induced and isolated from the anaerobic bacterial strain Clostridium cellulolyticum isoliert, as well as chemicaly synthesized. The new compound exhibited antibacterial activity against problematic germs as MRSA. Die Preise werden vom Leibniz-Forschungsverbund Wirkstoffe und Biotechnologie ausgegeben, verantwortliche Ansprechperson ist der Koordinator/die Koordinatorin, ersatzweise der/die Sprecher/in des Verbundes. Über die Preisvergabe entscheidet ein vom Verbund bestimmtes Komitee. Bei Nichtannahme oder bei der Preisvergabe widersprechenden Erkenntnissen wird zunächst der nachfolgende Vorschlag berücksichtigt. Das Preisgeld wird an den/die verantwortlichen Seniorwissenschaftler/in der preiswürdigen Erfindung vergeben, ersatzweise an den/die Direktor/in des verantwortlichen Instituts, welche/r über die angemessene und beitragsbezogene Verwendung intern frei entscheidet. Dem/der Koordinator/in ist vom Seniorwissenschaftler/in bis Ende des Preisjahres ein Verwendungsschema mit Überweisungsinformationen zu übermitteln. Die minimale Splittung ist € 100,-. Es besteht kein Rechtsanspruch auf den Erhalt des Preises oder des Preisgeldes. Die Entscheidungen sind nicht anfechtbar, der Rechtsweg ist ausgeschlossen.